A local artist presents his work at the 6th annual Frida Fest at Hinovations Art Gallery in McAllen on Sept. 7. 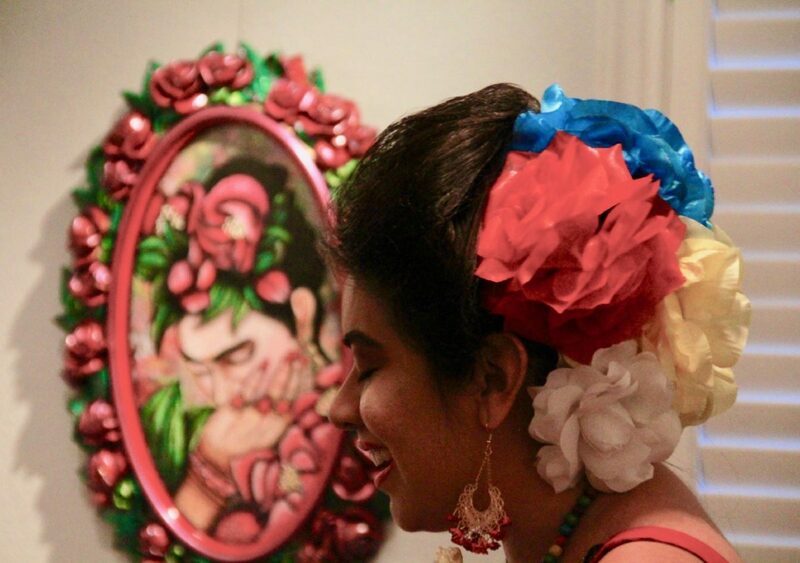 A crowd of more than 30 people filled Hinovations Art Gallery, a small, makeshift art gallery in central McAllen on Friday for the sixth annual Frida Fest. Artists from around the U.S., Mexico, Iran and Australia displayed art at the exhibit. Local artists presented their art in person while local poets performed on a small stage outside the venue. Raquel Hinojosa, director of Hinovations Art Gallery, has been putting on the event for the past six years. Until last year, they only had local artists attend. The event has slowly grown into the event it is today. 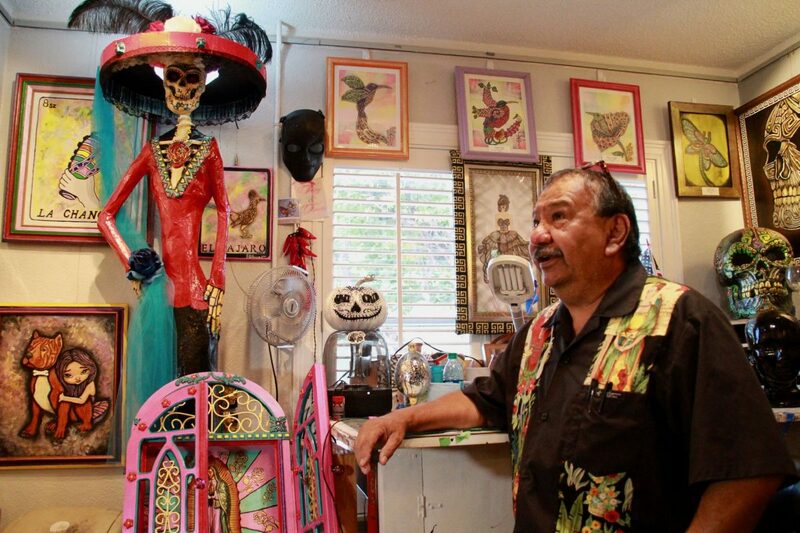 Hinojosa’s long goal was to make the annual art gallery into a bigger, traveling exhibit. This year it will make its way to Goliad, Texas, then back to a venue in Weslaco. Danielle Lopez, a local curandera, begins the 6th annual Frida Fest at Hinovations Art Gallery in McAllen with a ceremonial song on Sept. 7. “Having artists from everywhere submit work just spreads awareness of all the great things happening in the Valley,” Hinojosa said. Originally, she organized the event to celebrate Hispanic heritage throughout September. This year, the them was “Frida in Red,” which featured dozens of painting of Frida Kahlo with red notes. Danielle Lopez, a local curandera, opened the event with a “moon ceremony.” She’s been coming for three years now, and for the past two years she’s opened the event with a ceremonial song. Given today’s political climate, and where the Valley finds itself in that dialogue, Lopez feels art that celebrates her culture is more important now than ever. Juliet Hernandez, an artist from McAllen, said Frida has inspired he. Her painting of Frida is littered with symbolism, she said. For example, the red white and green hummingbird, which represents Mexico. The gallery will be on display at Hinovations art Gallery, 1009 Laurel Ave., for the rest of September.